LG announced the L Fino and L Bello entry-level smartphones a month ago and now the company is ready to unleash them to the market. The phones launch in Brazil this week with other countries in Latin America to follow soon. European and Asian markets are going to get the new droids in the coming weeks as well as the Commonwealth Independent States. The LG L Fino packs a 1.2GHz quad-core CPU, a 4.5" WVGA IPS display with a pixel density of 207ppi. Under the back cover, there's a 1,900mAh battery and the rear camera is 8MP. The phone runs Android 4.4.2 KitKat and comes with LG's Knock Code unlock feature. The LG L Bello is its bigger brother with a 5" FWVGA IPS display, 196 ppi pixel density. Because of the larger size, the battery is 2,540mAh, but the rear camera and Android version remain unchanged. Both smartphones come with microSD card slots. Pricing isn't detailed yet. The L Fino will be released in white, black, gold, red and green, while the L Bello will come in black, white and gold. 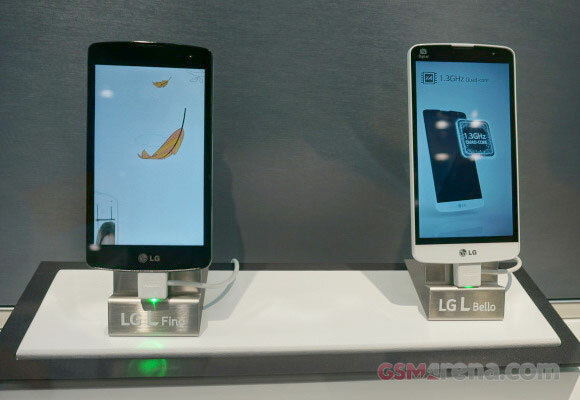 Make sure to check out our meetuing with the LG L Fino and L Bello at IFA 2014.